Bond thinks that the “creamy, feminine drink” of a “tall-stemmed glass of cream and vodka” is an amusing and clever secret recognition signal. In Risico while meeting with Kristatos, Bond orders a Negroni. 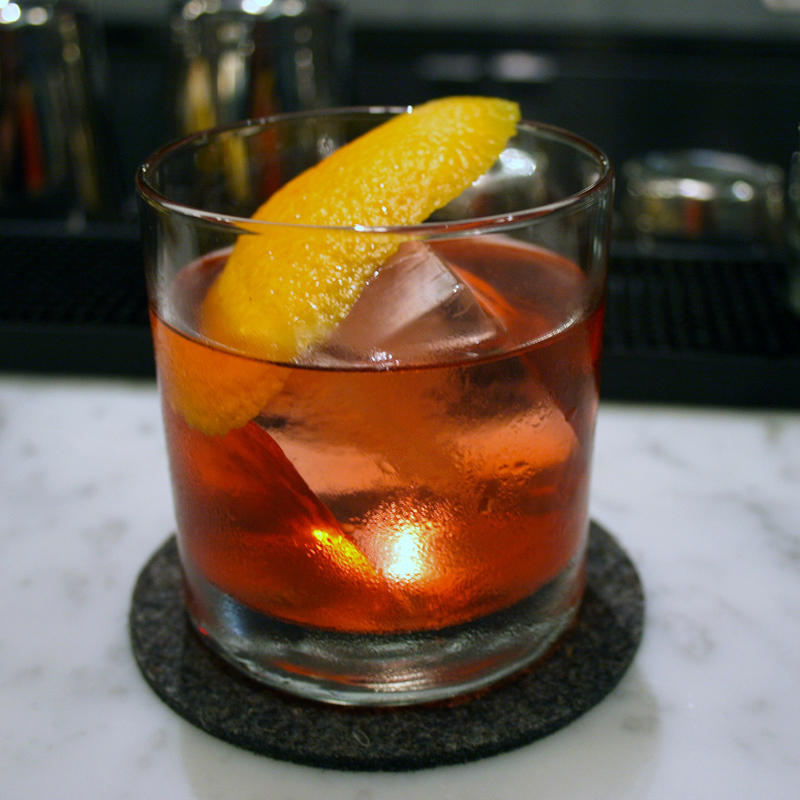 Like the Americano, the Negroni contains equal amounts Campari and sweet vermouth. It also contains an equal measure of gin. In the story, Bond specifies Gordon’s gin, a favorite of his. 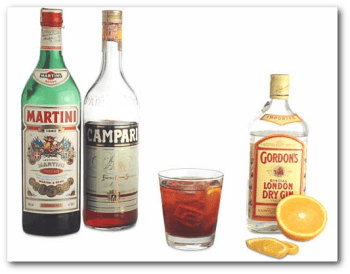 The drink is said to have been invented around 1920, when Count Camillo Negroni ordered an Americano—sweet vermouth, Campari and club soda—with gin swapped in for the standard soda. Others are skeptical of this claim, wondering if this yarn is just a bit of brilliant corporate PR by Campari, noting that the drink doesn’t appear in cocktail manuals until the middle of the century. Risico was written after Fleming visited Venice (and the Lido peninsula) in 1958. Negroni with Bond’s preferred Gordon’s. 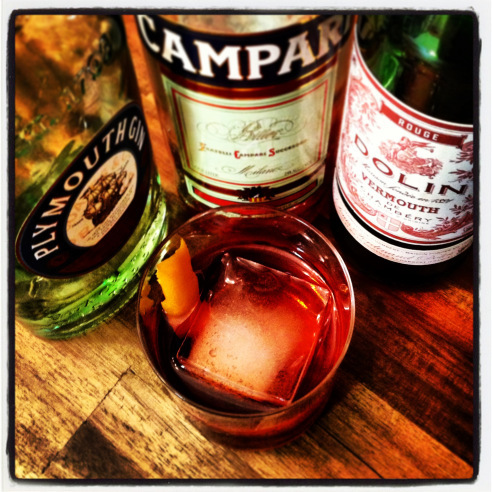 Plymouth Gin, Campari and Dolin Vermouth. The Americano holds the distinction of being the very first drink James Bond orders in the Ian Fleming series. In Casino Royale, while waiting for Mathis and Vesper, Bond enters the Hermitage bar, takes a seat by the windows, and orders an Americano. This drink consists of Campari, Sweet Vermouth and soda water. The liquor is usually on a 1-1 portion, poured over ice, and then the soda is poured over the top. The drink figures twice in the plot of From Russia With Love, both times while Bond is traveling. In the restaurant car, Bond ordered Americanos and a bottle of Chianti Broglio. The wonderful European hors d’oeuvres came. The waiter’s tray clattered down on the marble-topped table. With a slick one-handed jerk that Bond had never been able to copy, the waiter’s bottle-opener prised the cap off the Perrier. The man slipped the tab under the ice-bucket, said a mechanical “Voilà, M’sieur” and darted away. Bond put ice into his drink, filled it to the top with soda and took a long pull at it. The Americano is said to have originated in Milan, and was given its name because of its popularity among Americans who were in Italy during prohibition. Traditionally, a slice of orange, or orange peel goes with the drink, but as we see, Bond prefers lemon. It’s another example of Bond knowing exactly what he wants in a drink. In Risico, while in Venice to meet Lisl Baum the next day, Bond orders an Americano at Florian’s.